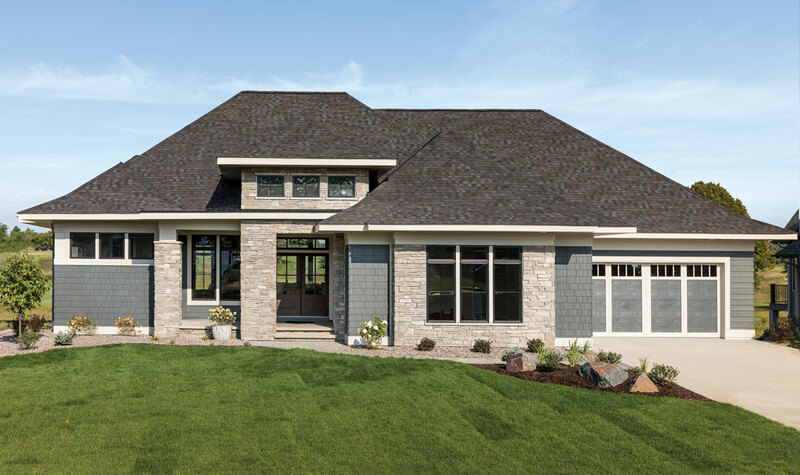 Many homes take inspiration from their setting, but the new Lake Elmo, Minnesota home built by Custom One Homes is defined by it. Next to a new golf course designed by Arnold Palmer and Annika Sorenstam, this home is all about the sport. 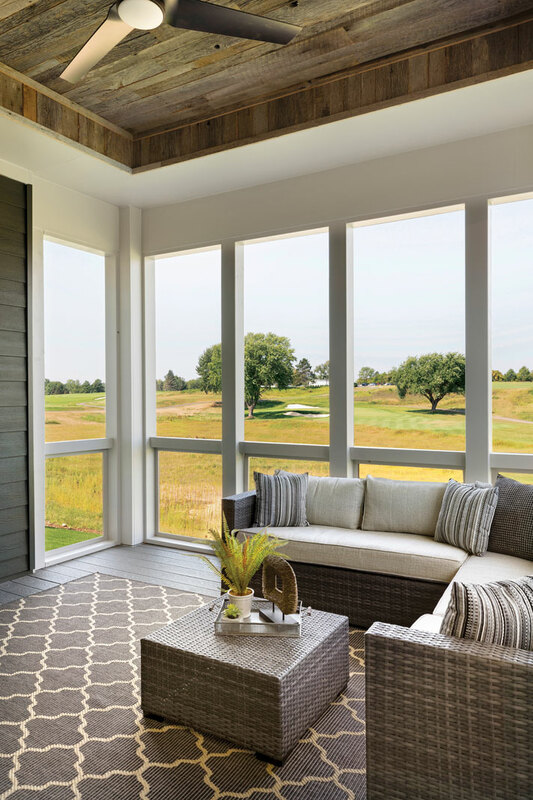 Through its strategically placed windows are views of the greens, wetlands, and woods that comprise The Royal Club golf course. Step inside the grand foyer and you see straight through to the green. Further evidence that this is a home for golf aficionados is in the garage, where there’s a designated spot for a golf cart. But it’s in the rambler’s lower level where the golf theme dominates. 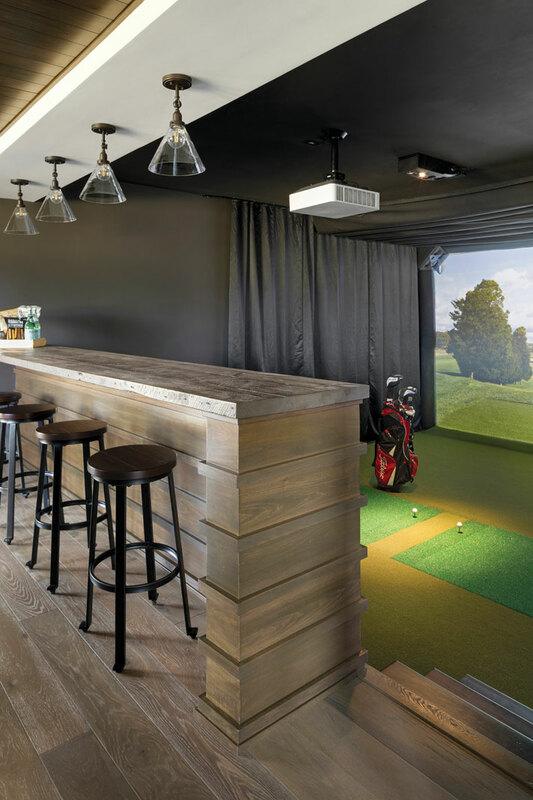 Custom One Homes dedicated a sunken 16-by-20-foot room to a simulator made by HD Golf. Here a full-sized human can hit a real golf ball into a screen displaying an image of one of the world’s best courses. The simulator can also be used to play other sports and video games or stream video. Picture watching Game of Thrones on a screen so big horses are almost life-sized. Friends and family can watch the simulated doings from the bar or nearby family room. 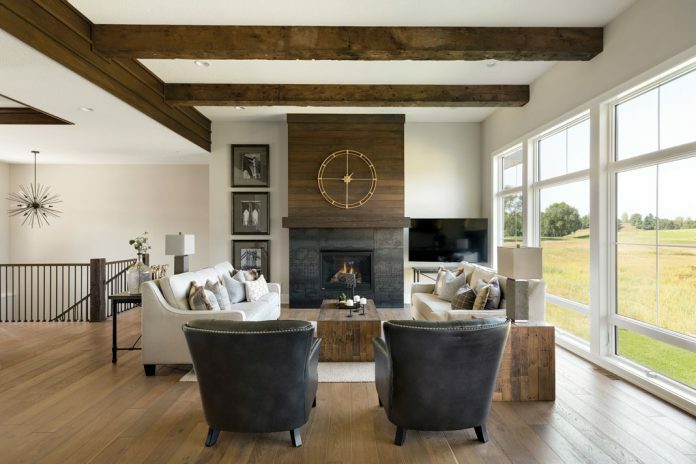 The home was designed with empty nesters in mind. At just under 4,200 finished square feet and with three bedrooms, the house is “right-sized for that active adult lifestyle, where they don’t want a huge house to clean but want all the amenities that their previous home had,” says David Zweber, principal of David Charlez Designs. 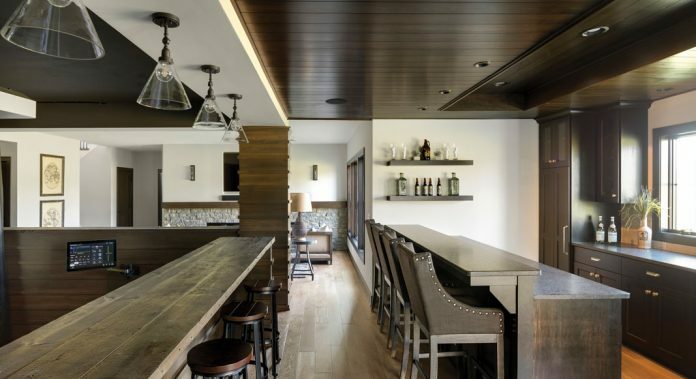 Among those amenities are a kitchen equipped with high-end Miele appliances, a 10-foot-wide island, custom cabinetry, and Cambria countertops. 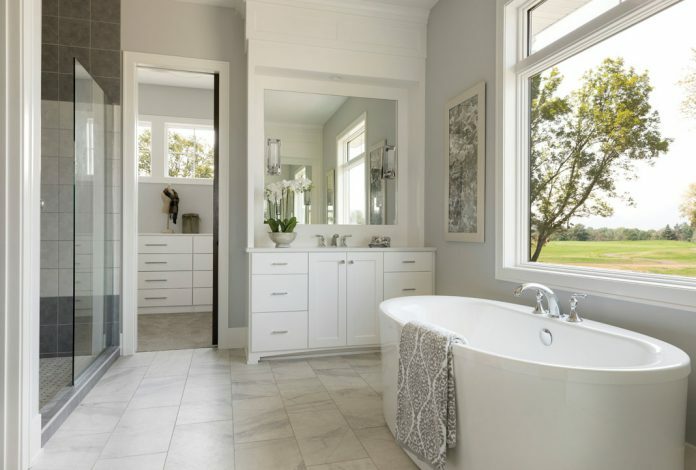 The large master bathroom has a walk-in shower, water closet, soaking tub, and separate his and hers vanities to avoid messes spilling over into your partner’s area. 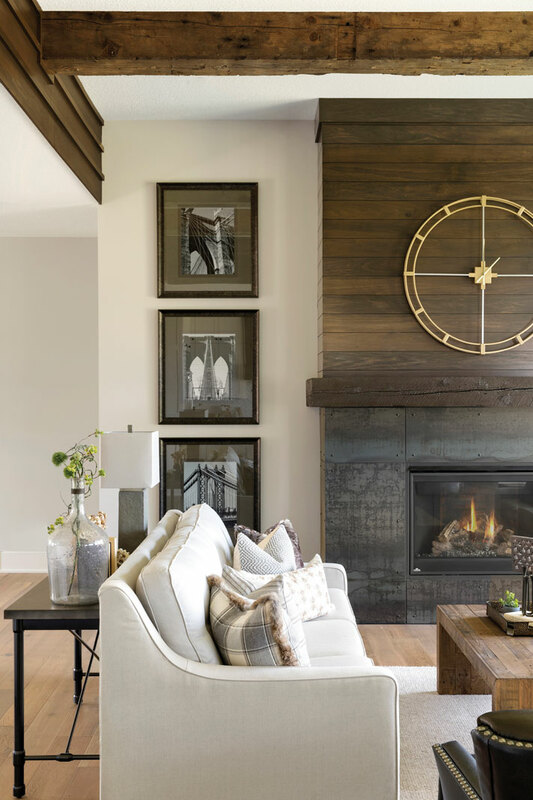 The home is infused with architectural details. 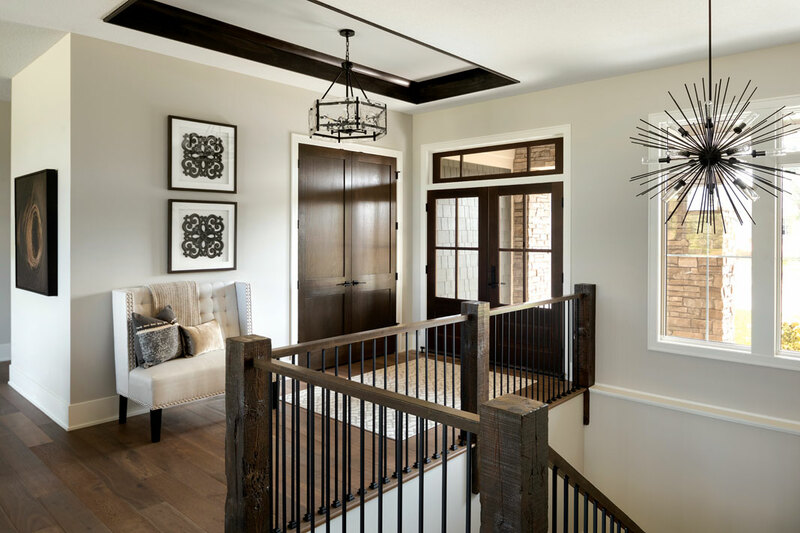 An extra-wide open staircase adds drama to the foyer as well as eases the transition between the upper and lower levels. Reclaimed wood beams lining the 12-foot-high ceiling in the great room help delineate the space and lend a rustic touch, as does steel cladding on the fireplace. Pocket doors with frosted glass hide the pantry and home office from view. A box vault inset with painted diagonal shiplap is a work of art overhead in the master suite. 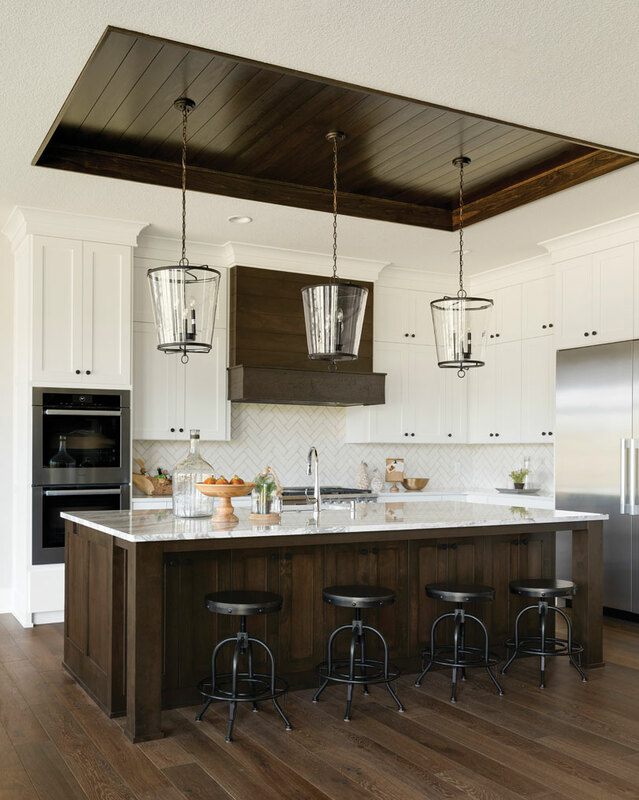 Dark-stained millwork, including inset strips above the island, lends richness and depth. 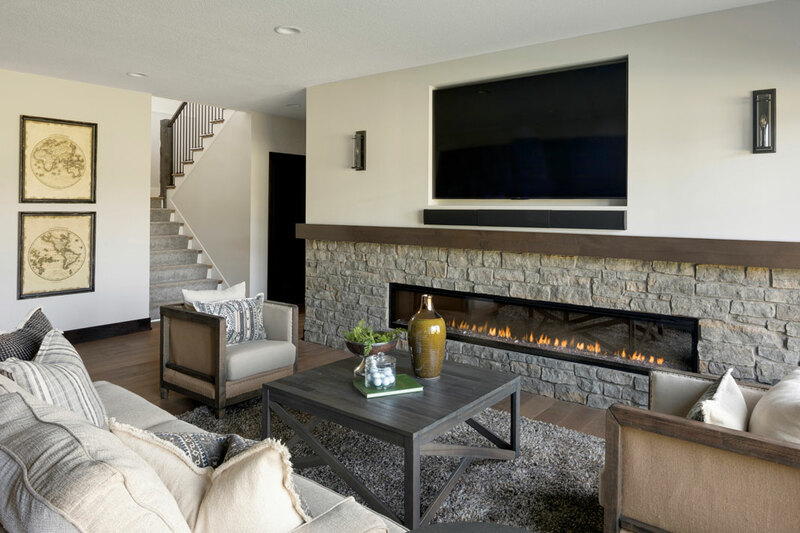 Designed for entertaining and easy upkeep, the home is all about lifestyle. “It’s kind of your retirement living,” Zweber says. And that’s fitting, as the house sits on land that for 50 years was a retreat for 3M retirees known as Tartan Park. 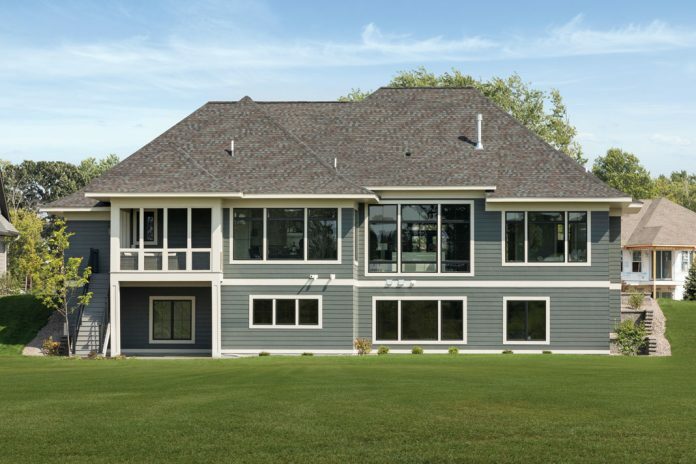 As its designer and builder have envisioned, this house is a retreat for a new generation of golf lovers.